Single use? Not always. This plastic bag holds bug-infested, rotten pears ready to be disposed of. No idea for how much longer you’ll be able to get plastic bags like this at the Albany Fred Meyer, but its parent company says it will stop giving them out in no more than seven years. The Kroger Company announced Thursday it will phase out single-use plastic shopping bags by 2025. Kroger is one of the country’s biggest grocery conglomerates. Fred Meyer is one of its chains. Ralphs in Southern California is another. This is supposed to be good for the environment, and maybe it is. But if so, why take seven years to make the change? My guess is that Kroger announced the long lead time so that other chains will be encouraged to follow suit. Otherwise, Kroger customers who like the convenience of plastic shopping bags might switch to stores that still offer them. Convenience? Yes, because those bags are useful. They line waste baskets. They hold all kinds of stuff, sweaty clothes after a bike ride, for example. Or, in my case now, daily loads of rotten pears that have fallen off the tree and need to be picked up lest they attract whole squadrons of aggressive wasps. Still, it’s hard to argue with asking people to bring their own shopping bags or — like they do in Corvallis — to pay a nickel each for paper bags. After all, people got their groceries home before plastic bags became common. We can do so again. No matter how many other uses we find for plastic shopping bags, over time we accumulate far more than we can use. And most are too flimsy for anything but very light duty. So we end up with bundles of filmy plastic that end up in the trash. Well damn……what will we put our cat litter box droppings into??? I also use plastic bags multiple times before discarding them and already use my own cloth bags most of the time. Will miss their convenience but know we lived without them before and can do it again. Even good changes can be tough! 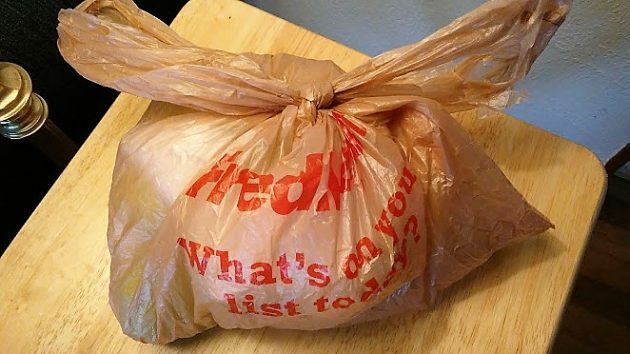 Yes, we got our groceries home, but stores didn’t charge us for the paper bags AND we had bagboys/girls that carried our groceries to our vehicles and load them too…without an extra charge. Change is always difficult for some. I have used reusable shopping bags for 5 years now and I can hardly recall when I didn’t use them. No law made do it. I just feel it’s the right thing to do. Our environment is swimming in one use disposable plastic. There are islands of it floating in our waters and filling our landfills. I too try to give the bags a second and third life but all the same they just don’t ever go away. This is a easy solution. Reusable bags can be bought for as little as 99 cents, have handy handles to carry more volume and are colorful. When I was managing the JCPenney store in Lebanon, I recall the hue & cry when we were forced to switch to plastic shopping bags from our paper bags. in corvallis most folks already carry cloth bags with them or can pay a nickle a bag. I believe it is required by law there. i dislike too many rules but i think this is a good one! many animals suffer and die needlessly due to plastic bags and container rings…not to mention the other environmental downsides. Props to Freddies but I do hope this happens sooner than later. dang that’s one reason I won’t shop Corvallis because I would have to PAY to get a grocery bag. I like Fred Meyer’s plastic shopping bags, which I use a lot. to clean up cat litter. to take out garbage, to carry things in and more. I hate that they will be doing this as I often forget to get reusable bags which aren’t that well made. I have a few that have fallen apart after a couple of uses. and had to PAY for those bags. Fred Meyer has a big bin by their grocery entrance for recycling one-use plastic grocery bags. I keep a lot of mine for scooping cat waste into. It won’t be as handy without the handles, but I can switch to paper bags for that. We’ll survive without so much plastic. However, WHO and WHY are we humans dumping garbage into the ocean. When we can put men on the moon WHY can’t we figure out a better way of disposing of our so called garbage. I’m slowly, grudgingly starting to accept the lack of useful, throwaway, bicycle-handlebar bags (in Corvallis). I have a battered $2 Fred Meyer “insulated” bag with specially-tied handles that somehow fits the handlebar adequately and has held up well. It even stands up fairly well in self-checkout and only slows things down by 50%. As an experiment, I tried fitting a (noninsulated) reusable bag around a “6 rolls = 8 rolls” package of paper towels – it worked! Bottom line: reusables are tolerable, would be really nice if some came with very short handles, but that’s just me because I’m a misguided, car-hating liberal. The question arises: how much of our plastic waste is due to THIS PARTICULAR type of bag? The likely answer is “not much.” Then, isn’t this effort just highly-visible, easy-to-target greenwashing and yet another needless way for the red tribe to ridicule the blue tribe? And to avoid dealing with the whole waste issue (as Kathryn suggests, above) in a meaningful way which might require REAL (but tolerable) inconvenience? Wow, judging by the comments – there has been some positive progress made in the last five years with more locals today understanding and accepting the reality that plastic bags while a ubiquitous and long time convenience for consumers ultimately in the grand scheme of things have few substantial advantages and are outweighed by the far reaching problems and negative effects they have on our increasingly plasticine-saturated planet from harming wildlife to polluting the environment with difficult to break down poly pieces and leaching endocrine disruptors into our water supply, streams and oceans. While some folks might remain fixated on the personal loss of plastic bags from Freddy’s, I hope the majority see this as a gain and ethical step moving forward perhaps not for only individuals but for the greater and large multi-faceted community, environment and the future lives we hope to lead. You mentioned on Valley Talk about plastic bags in the ditch – blame a lot of that on Republic garbage trucks. I live on a country road and see them lose bags. I pick them up and recycle. So Freddie’s is going ‘green’. I wonder if they too will start charging us for the paper bags that were the free grocery carriers of our past. This ‘green’ gesture is a profiable one for Freddie’s and every store that jumps on that ‘green’ band wagon. The store will eliminate their own expense of purchasing those grocery bags, while generously offering us the option to PURCHASE from them, other bags necessary to carry home the groceries we also purchase from them. They will also SELL for profit, other name brand plastic bags to those of us who have been recycling the grocery bags as garbage bags and other catch all needs. It’s a profitable win-win for the retail giant. The seven year mark is about Freddie’s concerns that this decision will shed customers who’ll go the extra 3/4 mile to Winco for the convenience, then find out that Winco is superior in prices and quality. The more you look at this, the more it looks like Freddie’s ‘green’ isn’t about a greener environment. It’s about profit$ in green. Of course all of those smug Prius drivers will applaud the grocery giant’s decision.